To meet the growing global demand for healthier food, drink and snack options, SPAR International has set out a clear strategy around own brand product reformulation, assessing ingredients and their origins, and adapting where necessary to reflect modern trends. We give an overview here of just some of the changes that took place during 2018, reflecting the focus on bringing healthier alternatives to the market. The recently launched vegetable crisps, which come in three variants, are made with 100% sunflower oil. Sold in an attractively designed 70g pack, the crisps have proven popular with customers in search of a low-carb snack that delivers a tasty savoury treat. Shopper reaction to the new sea-salt flavour potato crisps has also been positive. Made from three different types of potato for added flavour and taste, they have 30% less fat than traditional potato crisps and are made using sunflower oil. The Vegetable Crisps have been listed as a category finalist of the 2019 European Private Label Awards. SPAR International has a good selection of healthy, on-trend cold drink options that provide great refreshment. 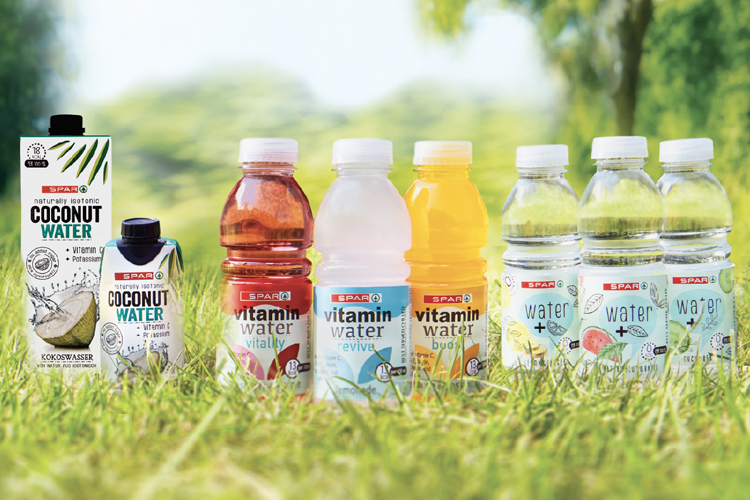 The range includes SPAR Infused Water, containing only natural fruit and plant extracts with 0 calories; SPAR Coconut Water, which takes all its goodness from nature and only includes naturally occurring sugars; and SPAR Vitamin Water, which contains only 13kcal and comes in three refreshing flavours to boost, revive and revitalise. SPAR retailers can complement locally sourced drinks ranges with these internationally sourced products, giving shoppers more choice. Sugar reduction has been a key focus and one of the SPAR Own Brand products that has seen a dramatic reduction in overall sugar content is the Blue Bear energy drink. In total, the sugar content of this product has been reduced more than 50% – from 10.6g to 4.8g per 100ml. Furthermore, the product has been relaunched with a more contemporary packing design, fitting with the ongoing adaptation of packaging materials and range reviews. Building on the expertise available within the global SPAR network, another one of the key products to recently undergo a refresh is the SPAR Italian Pasta range, which forms the backbone of the authentic Italian Range. SPAR Italian Pasta was one of the first products to be launched in the mid-1990s and now, SPAR International has introduced a fresh new packaging design across the full range, which is sourced directly from a supplier in the heart of Italy, recommended by local partner, DESPAR Italia. The pasta meets our criteria of having 12% protein content in the 100% durum wheat product. These new and refreshed products are allowing customers to choose healthier alternatives. By buying better together, SPAR International has combined volumes to meet the needs of various markets, delivering higher quality products to SPAR Partners around the world, enabling internationally sourced products to complement locally sourced ranges.